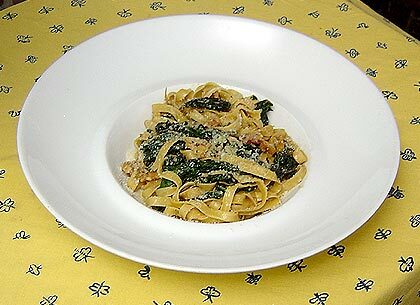 A delicious simple pasta dish with Swiss chard, walnuts and lemon. Over high heat, place the oil and garlic in a large sauté pan and gently cook until the garlic turns golden brown. Add 3 pinches of salt, 2 pinches of black pepper, and 2 pinches of crushed red pepper to the oil. Add the rosemary and Swiss chard. Sauté for 1 to 2 minutes. Drop the pasta into the boiling water and cook until it is tender but still has a bit of bite to it. While the pasta is cooking, add the stock to the Swiss chard and reduce for 1 to 2 minutes. Add the walnuts and cook for 30 seconds. Add the lemon juice and butter. Taste for seasoning. Strain the pasta from the water and add it to the Swiss chard. Toss it all together until most of the liquid is absorbed by the pasta. The pasta should be slightly creamy, and no extra sauce should be apparent. Divide into two bowls and serve. This segment appears in show #2905.